January in Mallorca, despite the winter weather is usually not only sunny, but also full of very special, traditional celebrations. 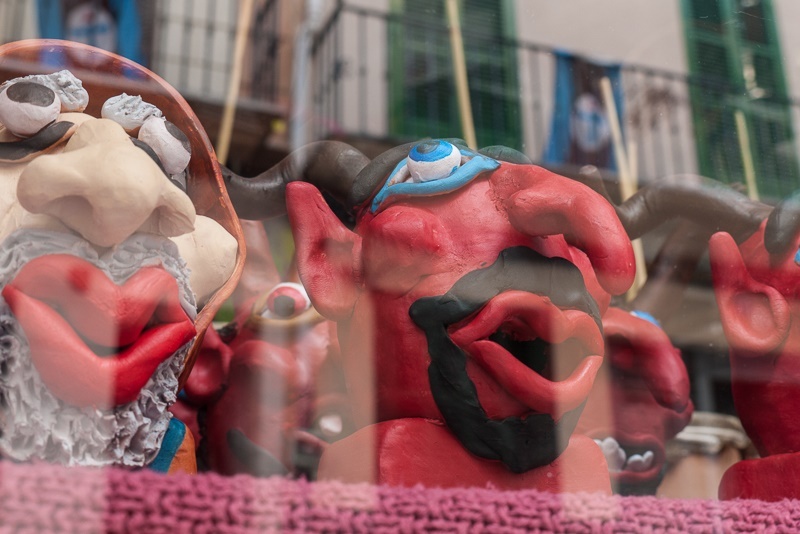 The “Dance with the Devil” is part of the celebrations in January. How gladly the usually rather quiet Mallorcans celebrate is particularly obvious at the beginning of year. The new year gets off to a great start in Mallorca, especially for children: On January 6, the three kings come to bring the Christmas gifts. The splendidly dressed wise men from the east come with their trinkets on the eve (5 January) on vessels into the ports, where they ride proud steeds through the streets and throw candy to the children. A particularly impressive spectacle in Palma is the procession of the “Reyes Magos” (in Mallorcan “Calvacada dels Reis Mags”) which is reminiscent of carnival. But even in coastal towns such as Cala Ratjada, this evening is extremely worth experiencing. On the morning of January 6, Caspar, Melchior and Balthasar parade through the villages from door-to-door and deliver the gifts (previously put in reception at the town hall). Furthermore at bedtime the kids leave a glass of liqueur or brandy for the kings and water for the horses outside their door and find presents in their place come morning. Those wanting to experience this magical procession in Palma, should arrive in good time to get a seat in the first row and a parking space for their car in a number of Palmas underground garages. The ship of the Kings arrives at about 18.00 at the old pier and the procession then travels once through the city – on the streets Antonio Maura, Borne, Plaça Joan Carles I, Carrer Unio, La Rambla, Passeig Mallorca, Avenida Jaume III to Plaça Cort. In January, two other important saints are celebrated: on the haunted night before the feast of St. Antonios, hell quite literally breaks loose: On January 16, bonfires are lit in many places and barbecue food with “sobrassada” – and “botifarra” – sausages are distributed by the town halls and served with warm red wine. Its a festival enjoyed especially in villages like Muro, Sa Pobla or Algaida. At midnight the devils or “dimonis” dance to a spectacular fireworks display. This “Devil’s Dance” is intended to drive away evil spirits and in many villages this old tradition is maintained with fervour. It is proud of the many diverse devil costumes and masks. What is ever more surprising, is how loud the otherwise rather quiet island folk become, so those daring to approach this “devilish”spectacular firework display, should definitely wear fireproof clothing! The next day, in front of many village churches pets – dogs, cats, but also sheep or guinea pigs – are blessed, as the Saint Anthony is the patron saint of animals. And it’s happily ever after in this month: On January 20, the feast day of Saint Sebastian is celebrated: The patron saint liberated the city in the 16th century from the plague. Simultaneous concerts with different styles of music – from rock to Mallorcan folklore to Flamenco – provide for nocturnal winter fun until the early morning hours at Plaça Cort and other places in the city such as Sant Francesc and Plaça Major. Not only Palma are on their feet, but Majorcans from all corners of the island come to join the celebration. 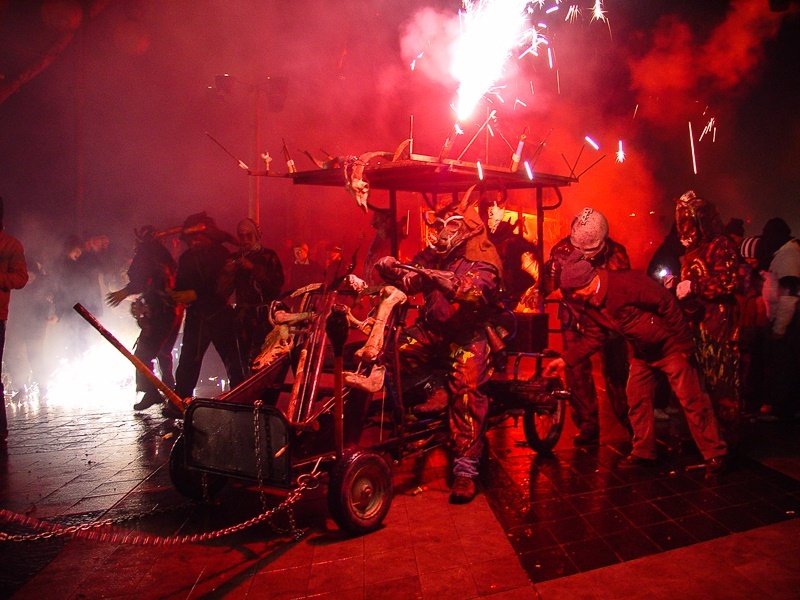 This festival is a multi-day spectacle with the “Torrats” road barbecues, the famous devil dances, the largest fireworks display “aiguafoc” on the Paseo Marítimo, and the awarding of the main prize of the city of Palma for literature, architecture and painting. The Town Council of Palma produces a program brochure with the week-long activities every year. Again: it is convenient to park your car in a parking garage and then throw yourself into the fray. In contrast to the Three Kings this time it’s a later evening with a 20.00 start for the concerts, and then from 22.00 Palma is transformed into a single party area. Anyone who believes Mallorca is boring in the winter, couldn’t be more wrong. 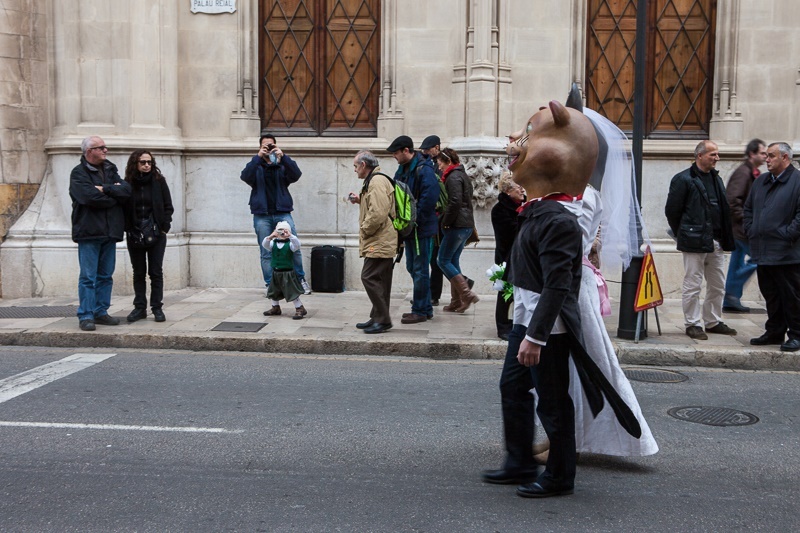 In early February Palma invites fun lovers to the big carnival parade “Sa Rua”. Attractions for children will be held beyond the little procession “Sa Rueta”. Everyone wants to win the costume and car competitions and that are sewn and crafted for many months. And if the whole spectacle is too loud for you and you prefer the quiet: Even nature offers a great spectacle – during this season approximately seven million almond trees bloom and the whole island becomes decorated in pink and white.